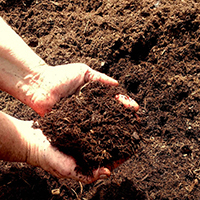 If you’re looking for a way to save lots of time in the garden, look no further than mulch. Mulching your flower and vegetable bed will drastically reduce the amount of time spent weeding, watering and fighting pests. Mulch conserves moisture. High Quality, Grade A Mulch. Manufactured using only the outer bark of the tree, All Bark Mulch boasts a high matting quality making it less likely to float or blow away. It is a finer material than most mulches, has a deep, rich color and an earthy aroma. 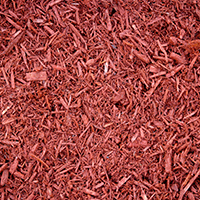 Hardwood mulch is far and away the most popular mulch used in the landscaping industry today. It is used to retain moisture in the soil, suppress weeds, and moderate the soil temperature. 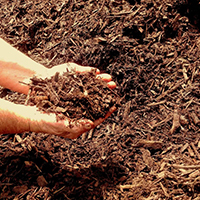 A natural wood product, hardwood mulch gives your landscaping project the ideal finish! Among the most desirable characteristics of hardwood mulches are their excellent resistance to compaction and blowing in the wind, their attractiveness, and their availability. Wood size is less than 3″. With our premium hardwood mulch at its base, colored mulch has all the benefits of mulch, including weed prevention and moisture retention, with the added benefit of providing a unique aesthetic enhancement to your property. Our colored mulches are dyed using a carbon based colorant, making it safe for the environment, plants, people, and pets.The dye used to color the mulch offers UV protection to the soil. 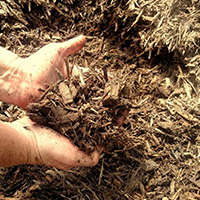 The UV-resistant mulch is more durable than regular mulch and typically lasts longer. And according to studies done by the University of California Cooperative Extension Office, colored mulches can provide a significant repulsion of aphids! With our premium hardwood mulch at its base, colored mulch has all the benefits of mulch, including weed prevention and moisture retention, with the added benefit of providing a unique aesthetic enhancement to your property. Our colored mulches are dyed using a carbon based colorant, making it safe for the environment, plants, people, and pets. The dye used to color the mulch offers UV protection to the soil. 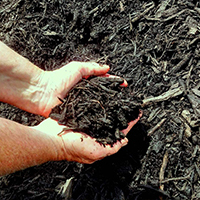 The UV-resistant mulch is more durable than regular mulch and typically lasts longer. And according to studies done by the University of California Cooperative Extension Office, colored mulches can provide a significant repulsion of aphids! Our certified playground Mulch is a playground surface covering manufactured and processed exclusively to meet the most a recent ADA Standard guidelines. It has been certified by an independent lab and meets or exceeds the ASTM testing requirements when it is used as recommended by the U.S. Consumer Product Safety Commission for playground surfaces. The average size of the playground wood chip is not in excess of 3″ in length and ¼” – ½” in thickness. 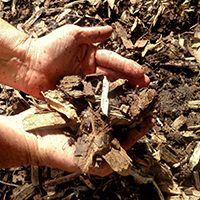 Our Playground Mulch is 95% free of bark, twigs and leaves. There are no chemical treatments, additives, waste woods, or recycled pallets used in order to decrease the possibility of contamination and the risk of poor surface stability. 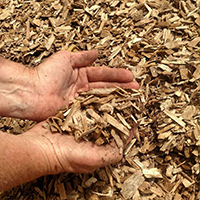 Our wood chips are made from logs that have been ground once through a wood chipper producing a chunky square material – unlike mulch, which is more shredded. Perfect for pathways, flower beds, landscaping, and more. Looking to add mulch to your flower beds, but need to freshen up your landscaping? We’ve got what you need! Check out our plants and produce area.